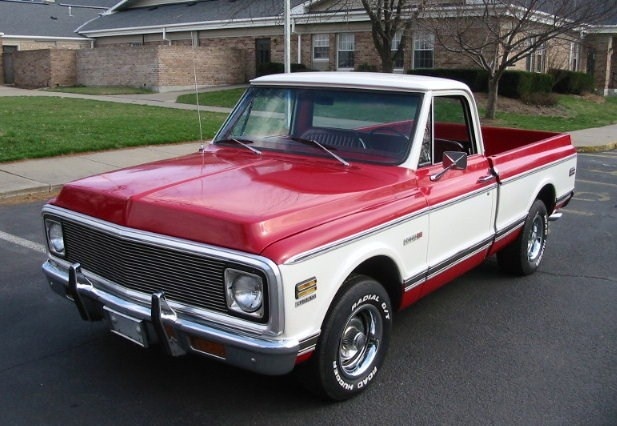 Have you driven a 1972 Chevrolet C/K 10? Displaying 1 - 10 of 17 1972 Chevrolet C/K 10 reviews. Back Seats Ranked 1972 Ford F-100 better. 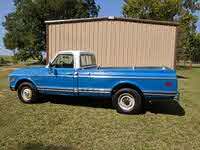 "there are none just said ford"
Family Car Ranked 1972 Ford F-100 better. "is pickup just said ford"
Looking for a Used C/K 10 in your area? CarGurus has 276 nationwide C/K 10 listings and the tools to find you a great deal. Typical Good Looking Truck — My dad bought me this truck when I was 16. When I moved out of the house he kept it in the garage and drove it every so often. I have had it for the last 3 years. I am planning on putting a new 350 GM crate motor in it soon. Cons: Always having motor issues. Good Solid Truck, Just Know Its Slow And Old And Loud And Bad On Gas. But Thats What Makes It Cool! — This truck is so customiseable its not even funny. the no smog title just adds to this even more. with my 6in,. lift I can conquer virtually and obstacle, add to that the 4wd with transfer case and front locking hubs this is truelly a irresistible offroad crawler. No electronics makes tuning and troubleshooting non-existent. set it and it goes or it doesn't. not half-in-between FI bs. Pros: Great truck, original SUV ( before they became over glorified soccer mom vans), chevy motor simple, powerful, and reliable, every part easily available, TH350 and 350-v8 make for a powerful package good for 250K before a rebuild. Can fit anything(cargo) except fridge due to low ceiling height from dual a/c unit in back. Camping and outdoors vehicle. Cons: Gas mileage get about 8mpg, handling not great and breaking is even worse. Interior rattling is really bad. Iit Can Be Worth A Lot Of Money. — They are perty rare now in days. They have different types of motors and customs. They start from a staight 6 all the way up to a big block v-8. Not much at l this was when stuff was built right. One of the most best body styles that cheverolet has ever adfore a truck. 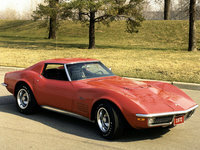 This is the only thing i dont like now in days is gas mileage, well the v-8's, but the small block v-8's aint that bad. This truck is very fun to drive its like driven a cadilac. Pros: I Love my truck, Would never concider owning anything else! Cons: Hard to find good 8-Tracks! Its Cool — I like it for a first vehicle. It has a few things wrong with it but nothing that cant be fixed. I think its fun to drive, but im not going to drive it until its fixed up fairly well.